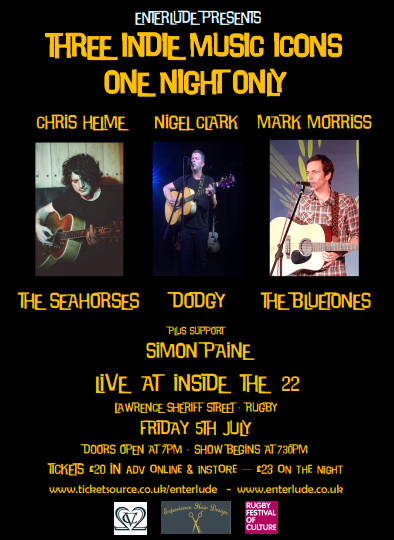 What a night we have for you at Inside The 22 in Rugby this summer. 3 of the finest indie icons from the 90's perform all of their hits and much more. Currently smashing it on the Shiiine On tour they take time to come to the place to be in the home of the game! Chris Helme first rose to prominence as the front man of John Squire’s post-Stone Roses band ‘The Seahorses’ with the anthemic Britpop classics 'Love Is The Law' and 'Blinded By The Sun'. Chris is now working on his second solo album. Singer songwriter who famously fronted English indie outfit The Bluetones over a successful and fruitful 15 year period, scoring 14 top ten singles and 3 top ten albums. Still touring with the band, Mark has released several solo albums. Nigel Clark, singer-songwriter, best known as the lead singer and bassist of Dodgy. Best known for their hits "Staying Out for the Summer", "If You're Thinking of Me", and "Good Enough" which reached No. 4 in the UK Singles Chart. He released his first solo album '21st Century Man' in 2006 before returning to front Dodgy and releasing a further two studio albums with a third in progress.